Celebrate scarf season, ethical shopping and gorgeous gift inspiration this weekend. If you're in the spirit for giving---what with the holidays creeping up and all---there's nothing better than finding something beautiful that can give you the socially-minded warm fuzzies, too. Enter TAMMACHAT Natural Textiles: Since 2007 owners Alleson Kase and Ellen Agger have been travelling to Thailand and Laos to help empower local craftswomen by working with them to bring their fairly traded handcrafted textiles to Halifax. Last year, tables were filled with pops of brilliant colour offering everything from hand embroidered change purses and luxurious scarves, to beautiful cushions, tablecloths and placemats. 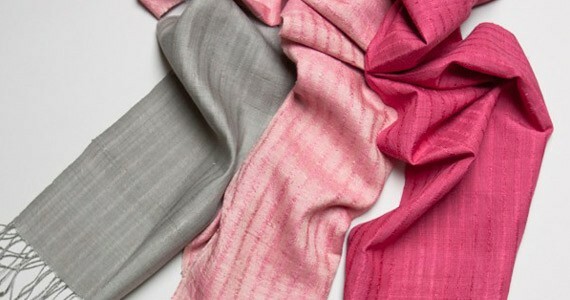 You can expect more of the same naturally dyed gorgeousness but with a few new items up for grabs like one-of-a-kind jackets sewn by a local dressmaker and scarves made from Eri silk---a non-traditional silkworm development project in Thailand. "It's a more textured silk, for a cooler climate," says Agger. Perfect for our Nova Scotian autumn.